What Else Can I Expect From an Online Master's in Elementary Education Program? Also known as primary education, elementary education refers to the first phase of institutionalized learning within the U.S. educational system. Most elementary schools accommodate students ranging from kindergarten (ages five to six) to fifth or sixth grade (ages 10 to 12) -- although some schools may reach up to the eighth grade (ages 13 to 14). Due to the relatively young student population, elementary education focuses on fundamental areas of English reading and writing, social studies, mathematics, science, art, music and other core school subjects. According to the National Center for Education Statistics (NCES), 39,339 pre-K to 8th grade students attended a U.S. school in Fall 2016; roughly 89% attended public schools, while the rest were enrolled at private institutions. The majority of elementary teachers begin their careers at the college level by earning a degree in elementary education. The bachelor's degree is considered the minimum requirement for elementary teachers in the U.S., but those who go on to pursue a master's will be able to advance in their careers even further. The master's curriculum explores more complex theories and approaches to the education of younger students. Master's students will also be required to complete student-teaching experiences, where they assist educators in working classrooms. Many of today's students are choosing to earn their master's degree in elementary education online, rather than in a classroom. Web-based students follow the same rigorous curriculum as their brick-and-mortar counterparts, often leading to the same number of post-degree job opportunities. The flexible, study-from-home schedule are ideal for students with part-time jobs, childcare duties and other important commitments. Learn more about what you can do with an online master's degree in elementary education and what kind of career opportunities you can look forward to with this comprehensive guide. Graduates with a master's in elementary education are prepared to pursue careers as elementary teachers, principals, and curriculum developers. Read more here..
HOW DO I GET A MASTER'S IN ELEMENTARY EDUCATION? Admission requirements for online master's in elementary education programs typically include a bachelor's degree and a minimum undergraduate GPA that varies from school to school. Some programs may also require standardized test scores or professional experience.Read more here..
An online master's degree in elementary education is ideal for K-6 educators who want to advance their careers and move into positions with more responsibility in their school. HOW DO YOU ABBREVIATE A MASTER'S IN ELEMENTARY EDUCATION? Online master's degrees in elementary education (MA in elementary education) are geared toward teaching professionals who wish to gain advanced insights into to their occupation. Read more here..
IS A MASTER'S IN ELEMENTARY EDUCATION WORTH IT? A master's in elementary education is worth it for working teachers who want to advance their careers or move into managerial positions such as elementary school principal or curriculum developer. WILL AN ONLINE MASTER'S IN ELEMENTARY EDUCATION PROGRAM PROVIDE ME WITH THE SKILLS I NEED TO ADVANCE MY CAREER? Online master's degrees in elementary education are geared toward teaching professionals who wish to gain advanced insights into to their occupation. Many master's pathways allow students to pursue degree specializations in fields like educational leadership, curriculum and instruction, special education and English as a Second Language (ESL). Specializations can lead to additional employment opportunities within these niche fields. Student-teaching sessions give elementary education master's degree-earners the chance to use their new skills and knowledge to address problems and concerns in real-world classrooms. WILL AN ONLINE MASTER'S IN ELEMENTARY EDUCATION PROGRAM WORK WITH MY SCHEDULE? Online master's degree programs offer a flexible, easily accessible alternative to traditional college learning. Students are able to download course lectures and readings, participate in virtual discussions with other students, submit written assignments, take exams and communicate with their professors from the comfort of their own home. Current technology also enables them to study away from desktop computer using a laptop, tablet, smartphone and other portable Wi-Fi devices. For added convenience, students can usually coordinate student-teaching opportunities at schools and other facilities that are reasonably close to their current residence. WHAT JOBS CAN I GET WITH MY MASTER'S DEGREE IN ELEMENTARY EDUCATION? Job eligibility for those who earn a master's in elementary education online will depend somewhat on their degree specialization. Those who concentrate their studies in areas like special education, leadership, administration or curriculum and instruction will likely be considered for more positions related to these fields. Master's recipients who choose to continue teaching also enjoy more job opportunities, as schools are likelier to hire candidates with advanced degrees -- and some states require a master's as part of the licensure process. The master's pathway may also serve as a stepping-stone for students who wish to advance into a doctoral education program. WHAT ARE THE BEST ONLINE MASTER'S IN ELEMENTARY EDUCATION PROGRAMS? Choosing a program is an incredibly personal decision, and only you can properly evaluate whether a target school's strengths match your educational needs. The following ranked list of schools should serve as a helpful starting point in your search for the best online master's degree in elementary education programs in the United States. Our ranking is based on the courses schools offer, available specializations, student outcomes, career support services, and other criteria used to determine academic excellence. If you are considering an online master's in elementary education, be sure to contact admissions specialists at different colleges and universities to learn more their about specific requirements and offerings. North Carolina State University in Raleigh offers a flexible elementary education master’s online degree taught by instructors with professional experience and expertise. Students participate in innovative courses that expose them to the best teaching practices for elementary educators and prepares them to teach in 21st century classrooms. The 33-credit hour curriculum covers topics such as classroom action research, teacher leadership, exploring diversity in the classroom and community, and professional development. In addition to the required coursework, students also participate in a semester-long student teaching experience. MA students apply the techniques they have learned over the course of the program to a group of students, evaluating children’s environment, classroom dynamics, and the abilities of each child. The accelerated program leads to a teaching license in as little as a year and a half. Applicants need a bachelor’s degree from a regionally accredited institution with a 3.0 minimum GPA, specific prerequisite courses, and a completed application. Students complete about a quarter of coursework on campus in Raleigh. For the remaining three quarters, instructors deliver coursework online both synchronously and asynchronously. The school offers students access to the same resources that on-campus students enjoy, including the library, financial aid services, and advising offices. Students work with financial aid advisors to explore the different options available to them, including scholarships, grants, and loans. Located in Pensacola, The University of West Florida consists of five different academic colleges offering a variety of degrees. The school makes the online master’s degree in elementary education available to students interested in teaching elementary children. The master of education in curriculum and instruction offers three specializations: elementary education comprehensive, middle level education comprehensive, and secondary education comprehensive. Students take the program completely online with no on-campus requirements. The 36-credit hour program focuses on critical thinking, communication, integrity and values, project management, and diversity skills. Courses cover classroom management, educational assessment, and issues in teacher education. Students learn to track and record the progress of their own students and evaluate individual performance in order to create the ideal curriculum. They learn how to treat students fairly, how to appropriately handle discipline, and how to encourage students of all backgrounds to feel comfortable. In addition to core coursework, students complete cognate courses covering topics such as literature for children and young adults, early literacy, and effective teaching and instruction. Applicants must either hold or be seeking their professional teaching certificate and possess a bachelor’s degree with a 3.0 minimum GPA. Admissions requires GRE or GMAT scores no more than five years old, transcripts, a letter of intent, and a completed admissions application. The university boasts affordable tuition rates and a number of financial aid opportunities including scholarships, student loans, and tuition waivers. Founded in 1907, East Carolina University is located in Greenville, North Carolina. The school offers its students a wide range of online degrees, including a master's of arts in elementary education and middle grades education. This program is specifically designed for current K-6 elementary teachers seeking leadership positions in their school, or learners who are pursuing M-level licensure. All courses are offered through Blackboard. The core curriculum includes 27 credits devoted to advanced study of the field, 12 of which are dedicated to the professional core and 15 to the elementary core. Professional core classes, like leadership and communication, are tailored to provide teachers with advanced knowledge of teaching methodology and human learning in school environments. Elementary core classes, like management and problem solving in elementary school, focus on the classroom implementation of these principles, and prepare instructors to build effective curriculums. The remaining nine credits are composed of courses reflecting a concentration in one of the following areas: academically gifted students, content pedagogy, teacher leadership in the elementary school, early childhood, and teaching English as a second language. Content diversity allows teachers to customize their online master’s degree in elementary education education across several different fields. Students must also complete fieldwork and a culminating thesis course. Students are eligible for M-level licensure after completing these requirements. The University of Alabama in Tuscaloosa offers a distance learning program with courses taught by the same instructors that teach on-campus courses. For working professionals interested in educating young children, the university offers an online master’s in elementary education. Students take classes completely online in coursework delivered asynchronously, allowing students with family and work obligations to advance their education. The program includes 30-36 credit hours covering topics like elementary school curriculum, evaluation of classroom learning, and educational research. Students choose one or two of the following specializations: language arts, mathematics, social studies, science, or literacy. In addition to core and specialization courses, students take electives approved by their advisor to complete the credit requirements. Applicants need their current bachelor’s-level Class B teaching certificate in elementary education or an equivalent, a bachelor’s degree in elementary education from an accredited institution with a 3.0 minimum GPA, a minimum score of 300 on the GRE or 50th on the MAT, and a completed admissions application. The university makes several scholarships and grants available to students in the program. The university also offers advising appointments for students to learn about all of the student loans and other financial aid opportunities available to them. Online students have access to all on-campus resources and facilities, including the library and student advising. The master’s in elementary education online at Nova Southeastern University in Fort Lauderdale, Florida, provides students with the skills and knowledge they need to advance their teaching career. Students learn how to manage their own classroom, develop curriculums, create instruction strategies, and learn to assess their students’ abilities in mathematics, language arts, and literacy. The 60-credit curriculum covers topics like classroom management and organization, methods of teaching reading in elementary school, school and society, and assessment and evaluation. The program focuses on teaching elementary students who come from a non-educational background. The program leads to certification for teachers in kindergarten-sixth grade classrooms. Students must also complete an internship: under the supervision of an experienced teacher, students will work full-time in a classroom for 14 weeks. Interns perform several different classroom duties such as instruction, lesson planning, and parent/teacher conferences. Applicants need a bachelor’s degree from an accredited institution with a 2.5 minimum GPA, GRE test results, and a completed admissions application. Students must maintain a cumulative GPA of 3.0 or higher in order to graduate. To earn their Florida teaching certificate, MA students must pass the Professional Education Test, General Knowledge Test, and their Subject Area Exam. The university boasts affordable tuition and offers students the opportunity to speak with an advisor about the different financial aid options for which they might qualify. A private Christian university, Mississippi College offers an elementary education degree online in two forms: a master's of education in elementary education and an education specialist degree in elementary education. Both emphasize the latest in research, theories, and methodologies, and enrolled students should expect to explore topics like pedagogy, special and gifted education, and English as a second language. The school boasts a half century of accreditation by the National Council for Accreditation of Teacher Education (NCATE) -- the longest in the state -- and Mississippi College's accredited master’s in elementary education online is designed specifically for the benefit of working teachers. The school's 30-credit program includes nine credits in core courses, 15 credits in advanced content methods and materials, and six credits in elementary electives. Transformational leadership is a priority at Mississippi College and this program teaches students how to be influential leaders in the classroom and among co-workers. An accredited master’s in elementary education online program, the curriculum can be completed in as few as 10 months (with online courses that run for seven weeks) and through an accelerated model that swiftly readies teachers for further work in the field while also preparing them for future doctoral studies. The school schedules program start dates throughout the year and students may begin their coursework at nearly any time. With competitive tuition pricing comparable to a public university and a pay-by-course model, Mississippi College's program is affordable for the working student on a budget. The curriculum covers topics like curriculum development, the history of education in the United States, and subject-specific courses on teaching mathematics, language, social studies, and science. To be considered, applicants must hold a bachelor's degree in elementary education and a valid class A educator's license. Once accepted, students must maintain a minimum 3.0 GPA throughout the program. California State University in Fullerton offers an elementary education master’s degree online. Students learn about curriculum and instructional leadership in elementary classroom teaching, early childhood education, meeting the needs of diverse learners, technology education, math and science education, and staff development in public and private schools. The 30-unit curriculum comprises nine units of core coursework; 12 units of concentration coursework; six units from courses focused on curriculum development; six units of electives; and three units of a research seminar, project, or thesis. Courses cover topics like curriculum theory and development, current issues and problems in bilingual or bicultural education, and technology and problem solving in schools. The research seminar requires students to prepare, develop, evaluate, and present curriculum research proposals for a graduate project. Students also complete a final project or a thesis based on individual research. Applicants need their teaching credential, a bachelor’s degree from an accredited institution with a 3.0 minimum GPA, and a completed admissions application. The school assigns admitted students an academic advisor to help them develop their plan of study. Students must maintain a minimum cumulative GPA of a 3.0 to complete the program. CSU places a high level of importance on academic advisement; each student regularly meets with their academic advisor. The school offers affordable tuition and makes financial aid opportunities readily available, including scholarships specific to the MA in education. Christian institution William Carey University may be based in southeast Mississippi but the school’s distance learning portal allows teachers throughout the country to continue their education through its online master’s in elementary education program. The program requires students to complete 30 credits and learners can earn their degree in as few as 15 months across five trimesters (fall, spring, and summer). Students can embark on this elementary education master's degree online program during any term. Learners enrolled at William Carey decided to either navigate the program through either a cohort model or individually. The cohort model promotes supportive relationships and enlivens the learning process, providing students with a clear path to completing the school's online master’s in elementary education program. Learners who choose the individual model complete the same coursework as their cohort counterparts, allowing busier students to operate on a more independent schedule. The school administers all programs asynchronously, providing maximum coursework flexibility for long-distance learners. Additionally, the program's emphasis on the development of a materials portfolio is immediately useful for students after graduation because much of the portfolio is intended for day-to-day classroom instruction. William Carey's program not only provides a strong backbone in pedagogical theory, practical instruction, and effectiveness in the classroom. The school emphasizes one-on-one attention, keeping class sizes small and providing many opportunities for peers and professors to interact online and build a rapport. According to the school, over 90% of full-time students at William Carey are granted some form of financial assistance, and the university offers a variety of financial aid options, including work-study programs, state grants, and scholarships. Designed for experienced teachers operating in the state of North Carolina, the University of North Carolina at Charlotte's online master’s in elementary education is designed for licensed elementary educators who seek to pursue graduate-level education part-time. An accredited master’s in elementary education online program, UNC Charlotte's program employs a combination of Moodle, a course management platform, and Saba Meeting, the university’s synchronous classroom meeting software, to allow students to learn from vast distances. Students from other states are welcome to apply, but they should check with their state’s board of education to ensure credits meet state requirements. UNC Charlotte's elementary education master’s degree online program emphasizes an educational philosophy that values diversity, multiple viewpoints, and broad cultural knowledge. Throughout the 33-credit program, students complete studies in three sequenced phases, including developing perspectives, collaborative inquiry, and investigative leadership. Once these requirements are completed, students complete 12 hours of courses in a concentration in one of the following areas: academically or intellectually gifted students, instructional systems technology, special education, or elementary mathematics. Students complete an elective from another concentration that interests them or they take varieties of constructivism in elementary education, a PhD course meant to prepare master’s students for doctoral level study. This course is highly beneficial for those who wish to further their development after they have completed the elementary education master’s online program. Housed in the Department of Reading and Elementary Education, the program is 100% online, and primarily offers classes in the fall and spring. Summer classes in the academically or intellectually gifted concentration are available on a select basis. To be considered for admittance, applicants must hold a bachelor's degree from a regionally accredited university with a minimum GPA of 3.0, possess a current teaching license in elementary education, and provide satisfactory test scores for the GRE or MAT. The University of Pittsburgh in Pennsylvania offers an elementary education master’s degree online for professionals interested in enhancing their teaching abilities. The 36-credit curriculum covers topics like elementary science methods, psychology of learning and development for education, and education and society. Students learn to use educational research and theories to expand their teaching capabilities, and the program emphasizes understanding and embracing diverse learners. The university offers an advanced format to students who earned their teaching certificate at the University of Pittsburgh. Students in the advanced format use 18 credits from their graduate certification program and add 18 credits of coursework to complete the elementary education master’s degree online. Students who completed a graduate education program at a different university can use up to 12 credits from their previous program toward the 36-credit requirement. Ideal candidates for the program possess either certification from the University of Pittsburgh or another undergraduate granting institution or graduate-level certification. The university also encourages international students without certification to apply to the program. Applicants possess a bachelor’s degree from an accredited institution with a 3.0 minimum GPA. Submission materials include a completed admissions application, two letters of recommendation, and a career goal statement. International students must provide English proficiency exam scores. The school makes tuition affordable and provides advising to students in need of financial aid advice, including information about student loans, scholarships, and grants for which they may qualify. Located in Boone, North Carolina, Appalachian State University offers many prestigious online degrees, including a master’s in elementary education online. The university’s curriculum and instruction department offers the master of arts in elementary education to students interested in teaching young children at both private and public institutions. The program emphasizes connecting and communicating with students from diverse backgrounds. Students focus on core areas of elementary education such as social studies, science, math, and literacy. Additionally, students develop the requisite skills for communicating with parents concerning the development of their children. The 39-credit curriculum covers recent trends and issues in education, advanced topics in diversity, teacher leadership and school improvement, and social and philosophical foundations of education. The program offers the opportunity for both initial and advanced licensure -- depending on the needs of the student. Instructors with experience as K-12 educators deliver the coursework in small class sizes to ensure that each learner receives individual attention. Instructors make themselves available through email, phone, text, and web conferencing. The program offers various start dates throughout the year. Applicants possess a bachelor’s degree with a minimum cumulative GPA of 3.0 from an accredited institution, GRE or MAT scores no more than five years old, a current resume, and a completed admissions application. The school offers students affordable tuition rates. Students meet with advisors to determine whether they qualify for scholarships, grants, or student loans. Graduate students may qualify for assistantship positions. The University of Nebraska in Kearney offers more than 30 online programs to its students. Learners interested in enhancing their teaching technique pursue the university’s online master’s degree in elementary education. On-campus instructors also teach the online coursework in small class sizes, providing students with individualized attention. Students contact their professors via phone, email, text, and web conferencing. The 36-credit hour curriculum covers topics like philosophy of education, curriculum development in multicultural education, education research, and technology tools for teachers. In addition to the required coursework, students must complete either a program examination or culminating project and the College of Education Survey of Desired Outcomes. In addition to the elementary education concentration, the curriculum and instruction master’s program offers the following concentration areas: early childhood education, STEM, secondary education, transitional certification, reading/special education, English as a second language, and instructional effectiveness. Students must apply for graduation within the first few weeks of the semester in which they plan to graduate, and they must meet with their assigned academic advisor. The program uses the Blackboard LMS and provides technical support to students. Applicants possess a bachelor’s degree from an accredited institution and a completed admissions application. The university offers affordable tuition and several financial aid options. The school encourages students to meet with their advisor to discuss all of the financial aid opportunities available to them, including scholarships, student loans, and grants. The University of Texas Rio Grande Valley offers an online master’s in elementary education to students hoping to thrive at the art of teaching young children. Students take the master of education in curriculum and instruction with a specialization in elementary math and science education completely online, providing students the flexibility needed to maintain their family and work life. MA students focus on math and science for elementary students, with special emphasis given to educating students from diverse backgrounds. The 30-credit curriculum covers topics like models and methods in science education; curriculum problems and process; mathematics and science education; and foundations of learning, cognition, and human development. Instructors deliver courses in a seven-week format. Applicants must submit their completed graduate admissions application with their application fee and official undergraduate transcripts with a 3.0 minimum GPA from an accredited institution. International students must provide all standard admissions requirements along with english proficiency exam results. Students can complete the program in as little as 10 months, and graduates often seek careers as teachers, mentors, educational consultants, instructional coordinators, curriculum specialists, and policy developers. The university boasts affordable tuition, and students meet with advisors to identify those student loans, scholarships, and grants for which they qualify. In particular, the program works with partner organizations to determine whether students can receive a $2,000 scholarship. Students interested in gaining their initial teaching certification for grades K-6 can pursue an elementary education master’s online at Regis University in Denver, Colorado. The curriculum focuses on four distinctive areas: Jesuit ideals like serving others, reflective practice, and striving for excellence; service learning using theory with practical application; data literacy and critical thinking to develop curriculum-focused teachers; and instructional technology in every course. The program consists of 44-47 credits and covers topics like culturally and linguistically diverse learners, educational research and critical reflection, effective learning environments, and educational psychology. In addition to the coursework, students complete five to eight hours of student teaching. Students take courses completely online with the exception of the student teaching requirement. The program’s flexibility enables learners to maintain their family and work lives. Applicants need a bachelor’s degree with a 2.75 minimum GPA from an accredited institution and submission of a background check, a current resume, and a critical essay. Upon completion of the program, students may earn their teaching certification in the state of Colorado. The school makes tuition affordable and recommends that students meet with an advisor to help them determine whether they qualify for scholarships, grants, or student loans. Advisors also help with creating a study plan and with ensuring that students understand course substitution options and the resources that the school makes available. In Springfield, Missouri State University offers an elementary education online degree that is flexible in both curriculum and scheduling. Students taking two classes or six credit hours each semester, including summer terms, can complete this 36-credit hour program in around two years. Learners choose one-third of their courses in the program, allowing them to orient their degree toward their educational and professional goals. The program makes the following specialization options available: early childhood, reading, technology, ESL, middle school, math, science, social science, or special education. An individualized combination of courses in those areas is also available. A third of MSU’s online master's in elementary education coursework is devoted to a personalized degree plan, which students tailor to their needs. Learners must enroll in an advanced theory and practice in student assessment and evaluation course during their final semester. Delivered through online coursework, MSU's curriculum and instruction concentration option focuses on theory and research, and emphasizes diverse approaches to instructional practices. Graduates possess the skills they need to teach college-level courses or to study at the PhD level while working in the K-12 education sector. Applicants must hold a bachelor's degree with a minimum GPA of 2.75 and provide current GRE scores to be considered for admission. Up to 30% of graduate work may be transferred to earn the elementary education master's online. Transfer work must have received an "A" or "B" grade from an accredited institution and must be approved by the Coordinator of the Elementary Education Graduate Program or the Department Head of Childhood Education and Family Studies. For students who do not wish to commit to a master’s degree program, MSU offers options for post-baccalaureate students to take graduate courses that lead to Missouri teacher certification. DePaul University in Chicago, Illinois, offers students interested in becoming expert teachers a master’s in elementary education online. The program not only focuses on subject areas like social studies, literacy, mathematics, and science, it also focuses on the best ways to connect with students. The curriculum comprises 17 quarter hours of pre-education introductory courses, 35 quarter hours of advanced standing courses, eight quarter hours of student teaching, and four quarter hours of a thesis. Courses cover topics like curriculum and strategies, teaching and learning elementary school mathematics, emerging reading and language arts, and classroom assessment. The student teaching requirement gives students the opportunity to employ all of the techniques and lessons learned throughout the master’s program directly in the classroom. The thesis requirement enables students to evaluate and synthesize course material. The program requires several content area prerequisites, including mathematics, physical science, earth and space science, life science, history, political science or civics, geography, and economics. Applicants need a bachelor’s degree from an accredited institution and a completed admissions application. The program typically takes students two years to complete and leads to an Illinois Professional Educator License with an endorsement in elementary education. The school makes tuition affordable and provides students an advisor who can help them determine whether they qualify for student loans, scholarships, or grants. Some students participate in graduate assistantship programs to help with tuition costs. The University of Alabama at Birmingham’s master of education in early childhood and elementary education prepares graduates for careers in teaching. After taking 12 credits of courses directly related to teaching, students also study topics like curriculum development, critical pedagogy, child psychology, and teaching in a multicultural society. These additional courses prepare students for specialized teaching environments like urban education, academically or intellectually gifted classrooms, and ESL. All told, UAB’s offering requires that students complete 31 to 34 credit hours, including a three-hour practicum placement. Tailored for learners with no previous teaching education or experience in teaching elementary students, the school offers a 58-credit alternative master’s program. UAB's alternative master’s program is also designed for students with bachelor degrees in other fields, allowing those without the undergraduate educational foundation to become certified upon completion. To be admitted, a candidate must hold a valid Alabama bachelor’s level professional educator certificate in elementary education. If students are not already certified, the alternative master's program prepares them to pursue certification. UAB also offers an early childhood and elementary education honors program for students looking for a more rigorous experience. Although learners complete the program online, students can request an appointment to sit in on a class at UAB and experience courses on-campus. The school makes accommodations for students with busy schedules, including classes offered on Saturdays and over the summer. Students interested in further studies may wish to pursue UAB's doctor of philosophy program in early childhood education. Once the program is completed (and provided that they maintain a minimum GPA of 3.25), students are eligible for class A certification in elementary education. UAB's convenient and state-of-the-art online instruction provides students with quality education at an affordable price. The University of Northern Iowa in Cedar Falls offers an elementary education master’s degree online to individuals hoping to earn their elementary education licensure for grades K-6. Courses follow a specific plan and move along in a sequence, and the school requires students to enroll at specific times to follow the sequence. Students unsure of whether they will miss a course due to extracurricular reasons should speak with advisors to address any deviation from the sequence. Courses in the beginning of the program serve as an introduction to the goals of the program, the sequence of courses, program standards, academic expectations, and rubrics. Over the course of the program, students learn about fundamental elementary education topics such as literacy, social studies, science, and mathematics, as well as new teaching techniques that help them connect with students from diverse backgrounds. The school assigns students an academic advisor that helps them develop their study plan and provides one-on-one support throughout the program. Applicants need a bachelor’s degree with a 3.0 minimum GPA from an accredited institution and a completed admissions application. The school typically admits applicants without any previous graduate credit in elementary education, but it will consider transfer students on the condition that they earned a B- grade or higher for their coursework. The university uses the Blackboard LMS and offers tech support to students with questions about how to use the platform. Jacksonville State University in Alabama offers students an online master’s in elementary education designed for professionals with certification in elementary education. Students build upon their teaching experience to learn new techniques and develop a greater understanding of students from diverse backgrounds. Courses cover foundational elementary education subjects, including social studies, science, math, and literacy. The school offers all courses completely online, with practicum requirements serving as the only face-to-face engagement. During practicums, students apply the techniques and lessons learned during their time in the program. The 31- to 34-credit hour curriculum includes specialty courses that show students how to teach in the 21st century classroom. Graduates of the program earn an Alabama Teacher Class A Certification in elementary education. Applicants need a bachelor's degree from an accredited institution, teacher certification in elementary education, and a completed application. Instructors deliver online courses using the Canvas Up LMS, and the school’s website provides helpful links to articles, tutorials, and videos for students unfamiliar with the platform. The school also provides online students with access to the university's IT department for any issues they may encounter with technology during their education. Lastly, the university assigns students an academic advisor to help them develop their degree plan and discuss financial aid opportunities, including scholarship opportunities, grants, student loans, and graduate assistantship positions. The University of North Dakota offers a master's of science in elementary education degree online program designed to prepare K-6 teachers to address their students' educational needs through a mixture of theory and practical experience. The curriculum includes 32 credit hours of courses and requires the completion of a three-credit hour teaching practicum (conducted within the student’s local community, this 90-hour teaching practicum must first be approved by the university). Depending on how many classes students take each semester, the school offers most classes asynchronously, and schedules start dates every fall, spring, and summer. The program commonly takes two to three years to complete. UND designed this program for the needs of students who hold teaching licenses and non-licensed applicants who want to follow a research-oriented study path both. Applicants should be aware that this program does not lead to certification. This online master's degree in elementary education program features live or recorded web classes available at a variety of convenient times, including nights and weekends. The school never requires candidates to visit campus during their course of study. Students can finish the program in just two years, over the course of six semesters (including two summer semesters). Additionally, the school offers students a variety of quality support services, including online tutoring, library access, tech support, and academic advising. UND's program application requires that applicants complete a personal statement consisting of three questions on the topic of character and professional history. The school's online master's in elementary education program offers in-state tuition for all accepted candidates, regardless of their state of residence. This master's elementary education online degree program is available with thesis and non-thesis options and is accredited by the Council for the Accreditation of Educator Preparation (CAEP). A private Christian institution, Liberty University is largest provider of online education in the world. The school offers several degrees in a variety of disciplines and its online master’s in elementary education is offered as a master's of arts in teaching. The program is perfect for applicants who have no previous teaching experience and wish to qualify for initial licensure. While the majority of the program's 36 required credits can be completed online, students must visit the Lynchburg, Virginia campus three times for multi-day learning intensives over the course of their studies. Students must also complete a three-credit student teaching practicum (which may be pursued near their place of residence). Online courses typically run for eight weeks and are designed to challenge and engage distance-learners. The curriculum is broken down into three sections: advanced education core courses, elementary education cognate, and professional courses. Together, these three elements of study provide a strong foundation of educational principles, classroom conduct, and professional skills. The program's curriculum includes courses on the foundations of exceptionality, reading and language acquisition, principles of behavior management, and more. 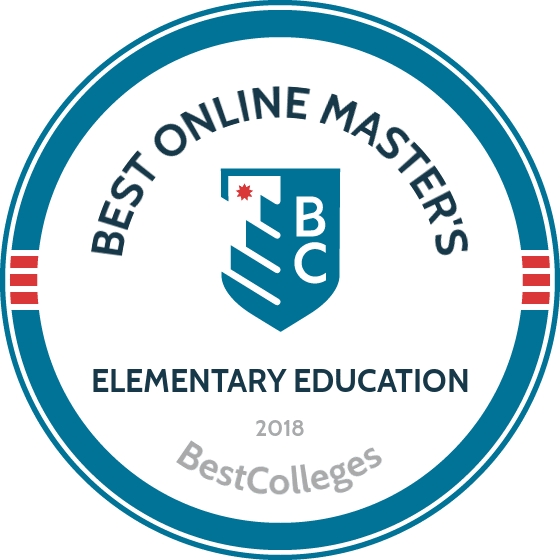 For acceptance into its elementary education master’s degree online program, Liberty requires applicants to hold a regionally or nationally accredited bachelor’s degree with at least a 3.0 GPA. And unlike many other online master’s in elementary education programs, Liberty University does not require students to have earned previous certification in the state of their residence. Liberty allows students to transfer up to 12 credits from a previous school, and offers free transfer evaluations, allowing students to decide if a degree at Liberty is the right choice for their education. Featuring some of the lowest tuition of all online degree programs, Liberty also offers a variety of scholarships and flexible payment plans. Western Governors University offers an elementary education degree online degree that prepares students to become highly qualified teachers, even if they have no prior experience in education. Offered as a master's of arts, this degree prepares students who hold a bachelor’s degree in a subject outside of education to gain their initial licensure as an elementary education teacher. WGU's program generally takes two to three years to complete. WGU was the first entirely online university to receive accreditation for its teacher licensure degrees from the National Council for Accreditation of Teacher Education. The university was also the first of its kind to implement a learning model based on competency, a model that allows students to utilize previously gained knowledge to accelerate the completion of their program. WGU charges tuition at a flat-rate per semester, which means that no matter how many courses students take a semester, tuition stays the same. This incentivizes finishing the degree plan at an accelerated pace. WGU makes financial aid available to all students. The 41-credit curriculum covers key topics including foundations of teaching, mathematics content, instructional planning and presentation, elementary education methods, and research fundamentals. Students must also complete a classroom practicum and a professional portfolio (the latter of which includes a resume and a philosophy of teaching statement). To be considered, applicants must hold a bachelor's degree with a minimum GPA of 2.5 and meet the rest of the school’s content requirements. Students work closely with a student mentor to devise and schedule a plan for completing courses. Student mentors provide valuable resources to students by, for example, guiding them through their individual course plans and building relationships with the students and being available to them when questions or concerns arise during the completion of the master's elementary education online program. Applicants should be aware that they cannot transfer credits toward the completion of this accredited master's in elementary education online program. Auburn University’s college of education in Alabama offers an online master’s degree in elementary education that allows students to work with experienced instructors. The university offers two different programs for students interested in studying elementary education: a master of education or a master of science. Both programs consist of 30 credit hours and cover a variety of topics, including approaches to teaching, the elementary school program, and basic methods in education research. Students must maintain a minimum 3.5 cumulative GPA. Students may elect to substitute required courses by filling out a form to gain approval. The master of education program caters to students already in possession of their initial-level teaching certification, preparing them for Class A Alabama professional educator certification upon completion. The master of science program does not result in professional educator certification. Applicants must complete a graduate school application, provide three references and GRE scores, clear a background check, and possess a bachelor's degree from an accredited institution. The university provides online students with access to several centers and institutes, including the Auburn Center for Evaluation, Center for Disability Research & Policy Studies, and the East Alabama Regional Inservice Center. All of these centers provide education students with useful tools, resources, and services. The school makes tuition affordable and offers student loan, scholarship, and grant options to help with costs. Lesley University in Cambridge, Massachusetts prepares students to make a difference in the world through teaching young children. Students pursuing their elementary education master’s online learn how to harness their experience to enable children to grow in their academic studies and as people. The program focuses on the core areas of elementary education: literacy, creative arts, technology, special education, mathematics, and science. MA students tailor their degree to their personal interests by choosing a specialization in English language learners, math, or literacy. The program focuses on STEM and technology-based learning approaches to ensure that students know how to teach in the 21st century. Graduates of the program work as teachers in private schools, charter schools, independent schools, early childhood centers, and public school districts. Applicants must complete prerequisites, possess a bachelor’s degree from an accredited institution, submit all official transcripts, provide one letter of recommendation from a present or former supervisor and one from a present or former professor, include a written personal statement, and complete the admissions application. The program features the latest online learning tools and resources and includes different interactive elements such as discussion forums and chats. The university offers a variety of support services to students and makes advisors available to help students explore financial aid options like grants, loans, and scholarships. An online master's degree in elementary education prepares candidates for licensure as an elementary school teacher, implementing a curriculum with the professional licensure available through a master's program. The quality of instruction for the best online master's in elementary education are usually backed by specialized accreditations, which work to ensure a standard of training and instruction. Teaching in actual classrooms gives a significant focus to a student's capstone thesis, and participation in academic networks helps to connect future teachers with existing elementary education communities. Literacy A literacy concentration provides an in-depth look at literacy issues, giving candidates for an online master's in elementary education program the ability to synthesize all the best practices and available research in reading instruction. Coursework entails a focus on the written and read components of literacy instruction and provides strategies for helping elementary students gain comfort with literacy and spoken communication. Special education instructor, elementary school teacher, reading programs specialist. Master's in elementary education online programs may differ, according to the established standards of a college or school. To gain an idea of what a curriculum for an online organizational leadership master's degree program look like, consult the list below. Foundations of Teaching: Students gain an overview of the historical, philosophical, and sociological texts that have influenced current educational theory and practice. Common issues in education, investigation of trends, and engagement with new methods prepares educators for future coursework in their concentration. Candidates will also develop and strengthen the necessary skills to succeed as graduate students. Elementary Education Methods: A fundamental part of any online master's degree in elementary education, this course covers activities, teaching strategies, and effective classroom management techniques. The course is designed to help elementary teachers in training to develop systematic methods to lead students to cooperate with each other and with supervisors. Tasks and learning strategies are put in context, often through observation. Instructional Planning and Presentation: Designed to lead teachers in training to design courses through the understanding of clear objectives and goals. Planning activities and assignments are discussed along with the various research around strategies to support student learning. Different approaches are considered, including field work, discussions, writing, and service-based collaboration. HOW LONG DOES IT TAKE TO GET AN ONLINE MASTER'S IN ELEMENTARY EDUCATION? The length of time that a student needs to complete a program may vary according to the circumstances of their application and desired licensing. Some students possess coursework from another previously attended college. In the case of a candidate having credits from another college or university, which will transfer towards the program they are applying to, their degree track would be amended to reflect the credits already completed. A student may encounter course lengths anywhere from eight to 12-weeks long. Some elementary education master's online programs require that students complete the program in a cohort. A cohort format has students move through the program as a synchronized group, taking classes at the same time to create an on-campus feel. Independent learning is usually quicker since it allows students to take a heavier courseload. Typically, elementary education master's degree online students may plan to complete a 30-33 credit program in two years. Teaching Licensure: A professional license is needed in order to practice teaching. As a teacher, you're responsible for the development, general aspirations, and standards of a student body. Licensure ensures that every person who assumes the responsibility of a teacher has the necessary knowledge and skill. Licenses are also issued at a state level, so different states have different policies. STEM and Technology Integration: The STEM (science, technology, engineering, and mathematics) and Technology certificate ensures that a candidate has the knowledge to interpret and utilize technology, specifically in order to enhance learning potential in the classroom. Certificate holders possesses the conceptual tools to approach technological change with confidence, as well as the ability to integrate new presentation methods and assisted learning protocols into their role as an elementary educator. Accreditation is important in order to maintain a high standard of education in institutions of higher learning. Regional accreditation is a process undertaken by a college or school in order to demonstrate that a program meets a minimum standard of excellence; it is generally considered to be more prestigious than national accreditation. There is no specific accreditation required regarding the best online master's degree in elementary education. However, teacher-focused groups like NCATE (the National Council for Accreditation of Teacher Education) and ACEI (the Association for Childhood Education International) exist to maintain training standards for teachers. The Department of Education is a federal agency established in 1979 which was formed to regulate policies concerning all schools and colleges within the United States, and to coordinate federal assistance for education, gather data about schools, and enforce federal laws regarding education. It works to promote the success of education within the United States and has no direct hand in the accreditation process. The CHEA and works to maintain educational standards and keep universities competitive with colleges and schools within the US, and with institutions of higher learning around the world. A list of universities with national accreditation is available directly from the U.S. Department of Education. Like many graduate degree programs, the master's in elementary education pathway builds on the foundational areas of undergraduate study while introducing more advanced ideas, theories and approaches to the profession. Students should expect coursework in subjects like standards-based education, educational technology and digital learning, curriculum and instructional development, advanced methods of student assessment and behavioral psychology. The curriculum will also include modules exploring research methods directly related to elementary learning. In most cases, students in master's programs have already earned their teaching license, so certification prep is normally not part of the standard curriculum. A wide range of degree specializations are available for master's in elementary education degree students. Those who would like to work with students with disabilities may pursue a special education concentration, while those with an interest in the subjects students learn may be drawn to a specialization in curriculum and instruction. A focus on educational leadership is ideal for aspiring principals, senior administrators and other top-level school officials. Other common specializations include reading and literacy or early childhood education (typically pre-K to third grade). In some general education master's programs, 'elementary education' is considered the degree specialization. It's important to research the accreditation status of a master's in elementary education degree program before fully committing to it. In the U.S., online elementary education master's programs receive accreditation from the Council for the Accreditation of Educator Preparation (CAEP). In addition to programmatic accreditation, make sure that the college or university has received regional or national accreditation. The demand for qualified, licensed teachers and administrators is quite high, which means that the job outlook for master's degree-holding elementary educators is quite favorable. U.S. News & World Report estimates that the unemployment rate for elementary school teachers is currently set at 3.0%. The table below compares this figure to the unemployment rates of teachers at other types of public and private schools. As the table shows, elementary school teachers face comparable unemployment odds as middle school teachers -- and higher unemployment rates than high school teachers. However, it's worth noting that the rate for elementary school teachers is still much lower than the national unemployment average for all industries, which is currently set at 4.7%. The salary potential of teachers and education professionals is often tied to their master's degree area of study. How do elementary education degree-holders measure up against other education master's degree recipients? Using data from the 2016-17 PayScale College Salary Report, the following table looks at earning expectations for different education majors at two early career benchmarks. Of the seven fields listed, the average wage premium (or salary growth) between the entry-level and mid-career stages is 37.8%. In addition to bachelor's degree major, the salary potential of an elementary teacher will also depend on their specific job title. Other important factors include licensure status, experience level and city/state of employment. The next table looks at career salary growth expectations for four common career paths for math education master's recipients. All four occupations experience a salary growth rate of at least 13% after 20 years on the job. Curriculum developers reported the highest growth rate: a 49.9% increase in earnings between the entry-level and late-career stages. Elementary teachers ranked second (despite having the lowest salaries at all four benchmarks) with 47.4% salary growth, followed by special education teachers with 39.7% growth. Students who leave school with a master's in elementary education will be qualified for a wide range of positions, although their eligibility will largely depend on their area of specialization. Four common career paths for master's in elementary education recipients are outlined below. Kindergarten and Elementary School Teachers: In most elementary school classrooms, the teacher is responsible for delivering lessons on a variety of subjects, including reading and writing, math, science, art and music. These teachers are also trained to recognize the early signs of learning disabilities, behavioral disorders and other impediments to productive learning in young students. Elementary, Middle and High School Principals: Principals oversee the various operations and activities at public and private schools. Their day-to-day duties include monitoring and evaluating teachers and other school personnel, approving curriculum standards, meeting with other administrators and, in some cases, discussing disciplinary actions with students and their parents. Instructional Coordinators: Instructional coordinators develop curriculum standards for different lessons taught in public and private schools. They also train teachers and other school staff how to deliver and assess student progress in different areas, and also evaluate current curriculum standards to see if there are areas for future improvement. Special Education Teachers: Special education teachers specialize in the instruction and supervision of students with disabilities ranging from minor to severe. At most public and private elementary schools, students receive special education services in dedicated classrooms outside their primary classroom. Making professional connections and learning about different approaches to elementary education is crucial to your success. Professional organizations offer a great entry point for students who want to learn more about their chosen career path. Below you'll find three of the country's most prominent organizations established for elementary teachers and education professionals. These organizations host networking events, provide online trainings, maintain active job boards, and offer other services for career-ready college graduates. Resources like these often prove invaluable as you complete your degree requirements and prepare to enter the job market. National Association for the Education of Young Children: In addition to accreditation of college programs, the NAEYC offers a wide range of supportive services for professionals who teach and assist children from birth to age eight. Member benefits include discounted books and other resources, complimentary magazine and newsletter subscriptions and access to 'Members Only' areas of the organization's website.